Direct seeding labor rate is $50/ hour for a minimum of 3 hours. Direct seeding can be combined with other labor hours to achieve minimum requirement. Cost of seed is included in labor rate. Plant species used, are selected to match the site conditions and the objectives of the landowner. Common seed mixes are Woodland wildflower mix, Wildflower/shrub understory mix, Wetland mi, hardwood tree and shrub mix. All plants in the wild originate from seed. Direct seeding mimics what occurs naturally in nature but with defined goals and measurable results. You only need to look around in nature to see what nature achieves through the natural process of direct seeding. Direct seeding mimics what occurs naturally in nature but with defined goals and measurable results. Direct seeding is the most efficient and cost effective way to establish large numbers of plants under natural conditions. No other method of establishing plants can achieve the same results. Complete plant communities can be established on large acreages using this simple technique. 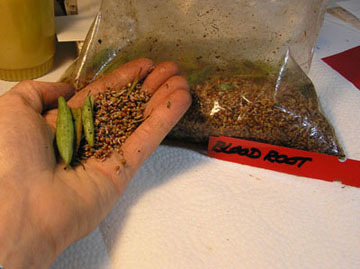 You will be able to achieve so much more using direct seeding compared to purchasing seedlings. Seed can be introduced at each stage of vegetative succession; old field, shrubland, young woodland and mature woodland. Each successional stage requires the introduction of plants adapted to that particular stage. Choosing the right plants will ensure that the plant community you are establishing will flourish. Species are chosen that provide both ornamental interests and ecological benefits. The introduction of key species serves to increase biological diversity. Diverse plant communities support the greatest number of wildlife species, such as song birds and butterflies that beautify your surroundings. The majority of native plants provide beautiful flowers, colorful fruits and stunning fall color that will increase the visual impact of your land. Why is it necessary to restore native plants? Won't they grow on thier own? Won't nature take care of things? Most land today shows the results of decades of human impact. Non-native invasive plants are running rampant across the landscape and most plant communities have just a fraction of the species that they should. Missing populations of native plants have no way to reestablish themselves without the help of people. Direct seeding is the efficient low cost way to reverse this trend and enhance the biological health and beauty of your property. White Oak Nursery has been growing native plants from seed for over 20 years. I hand collect seed of each species and I understand each ones growing requirements. Most seed is collected from local populations. There are just too many variables in nature to guarantee specific results or a certain number of plants. But a minimum rate of introduction can be assured. The average rate of placement of seed in the ground is between 300 to 500 locations per hour with several thousand seed planted. If 50% of the sites produce seedlings, a reasonable survival rate, the cost per plant is 15 to 25 cents per plant. That is a pretty good value. Suggested species for planting in different habitats. Nature produces an abundance of seed, planted under the right conditions, each seed has the potential to grow into a new plant. 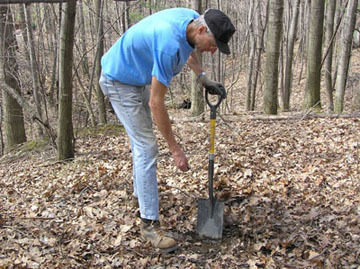 Direct seeding a mixture of woodland species. Direct seeding mimics how plants reproduce in nature. A large number of species can be introduced at one time. This process can be used to restore and enrich nearly any type of plant community. Chokecherry seed sprouting after seed treatment. A high percentage of seed will germinate and develop into seedings.